Filed to: They Did It!Filed to: They Did It! An article in today's New York Times today describes the efforts by women's groups and filmmakers to honor the women who took over posts at factories while men were deployed abroad for their service. Nearly 60 years later, Garnet Kozielec still marvels at the journey that took her from a job wrapping porcelain dishes to doing so-called "man's work" making bombers and fighter jets and from her home in West Virginia to Michigan and then California. In 1942, she and 27 others from the Dunbar, W.Va., area joined millions of women recruited as workers during World War II. Collectively, they were known as Rosies, after Rosie the Riveter, a fictional character at the center of a 1940s government campaign. 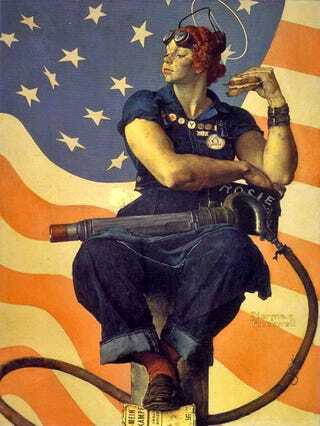 Wearing a bandanna and bright red lipstick, with her sleeves rolled up to reveal muscular arms, Rosie was portrayed in song and illustration as a tireless, patriotic worker. Estimates of how many women participated in the wartime workforce vary from 6 million to 16 million. No official tally exists because "when the war ended, they just lost all the paperwork," said Donnaleen Lanktree, is president of the American Rosie the Riveters Association, a group that has identified some 800 living Rosies. Ms. Lanktree said her own mother, the daughter of Belgian immigrants, worked nearly 70 hours a week for two years riveting the wings of Navy planes in Detroit. Anne Montague, president of the group Thanks! Plain and Simple, has reached out to the Rosies as an effort to honor all those who participated in the war effort. Ms. Montague's group is racing against time make a documentary about the experiences of Rosies from West Virginia. Ms. Kozielec is the only survivor of the group from Shepherdstown. Nationwide, the age of the living Rosies ranges from the late 70s to the mid-90s. "Through the war, they really thought and very deeply felt that what they did was in comparison to the men, was so minor," Ms. Montague said. "But now that they look back on it, they really are beginning to understand that it was an incredibly important contribution."